Product prices and availability are accurate as of 2019-04-20 10:47:08 EDT and are subject to change. Any price and availability information displayed on http://www.amazon.com/ at the time of purchase will apply to the purchase of this product. This bright, colourful fun-to-learn jigsaw is a great way to discover fascinating facts about dinosaurs. 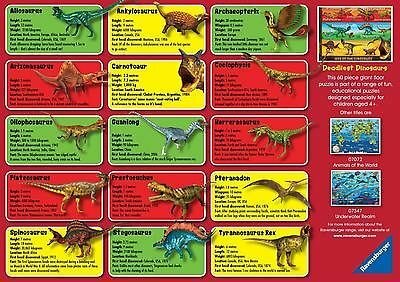 The puzzle shows the deadliest dinosaurs from the Triassic, Jurassic and Cretaceous eras. 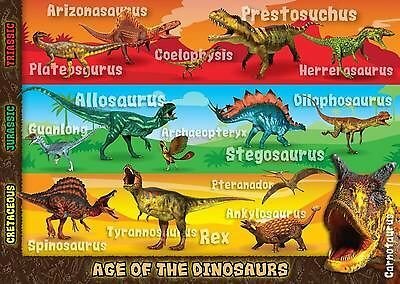 The Triassic period includes the Arizonasaurus (believed to be distant relatives of crocodiles), the Jurassic period shows the well-known Stegosaurus (first fossils discovered in Colorado in 1876), whilst the Cretaceous period is dominated by the fearsome Tyrannosaurus Rex (first fossil discovered in 1874). There are 15 dinosaurs depicted on the puzzle, so plenty to be discovered and enjoyed. 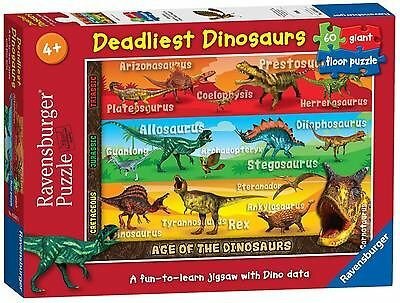 The puzzle comes with an in-box leaflet giving height, length, weight of each dinosaur, so young puzzle fans can compare them, and decide which is the deadliest! High quality 60 piece cardboard jigsaw puzzle. The finished puzzle measures 70 x 50cm when complete. Suitable for ages 4 years and up. Made from strong premium grade cardboard, with linen finish print to minimise glare on puzzle image.